Amethyst with its stunning violet-purple color needs no introduction, the gemstone has been appreciated, highly sought after and even worshiped in many civilizations. Laying your hands on a big amethyst gem is not a big challenge but, finding a gem that has been exquisitely shaped and cut is surely not easy. 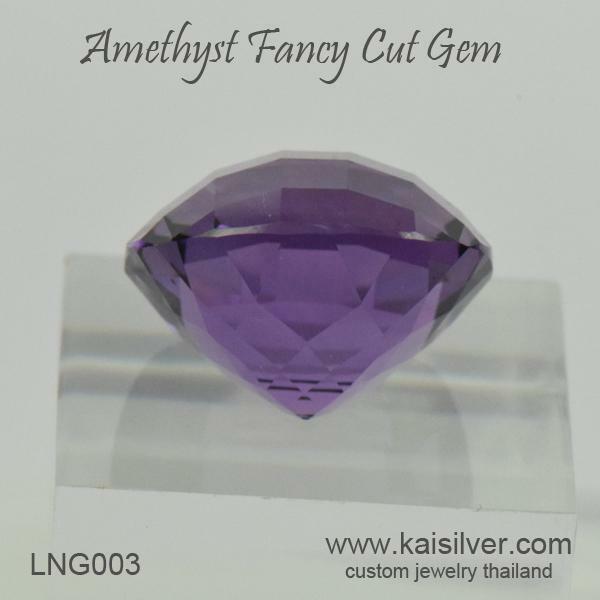 The LNG003 18x18mm cushion shaped amethyst gem has its origin in a large piece of rough amethyst, handpicked by Kaisilver gem experts. 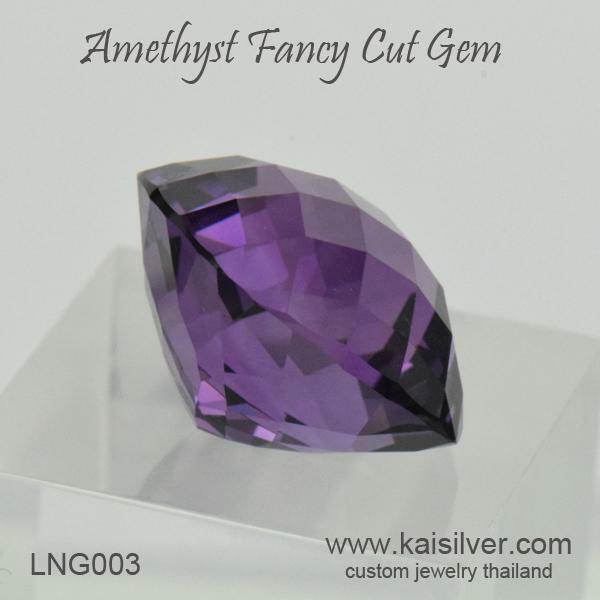 We began with a gorgeous piece of rough amethyst that measured around 15 times the size of the final piece, it is normal to lose about 85-90% of rough gem when cutting such intricately faceted and shaped gems. The gem measures 18x18mm and is perfectly supported with a depth of around 13mm. The gem artist works his magic on the entire 22 carats (weight) that make up this big amethyst gem. The price tag on this exquisite amethyst gem, reflects the quality of the gem and the tremendous talent and effort that is invested in crafting this masterpiece - a knowledgeable gem lover would be pleased with the 750 U.S$ tag for the piece. Decades of cutting experience and talent inspire the gem artists to create a unique gemstone, often this happens to be a piece that is hard to repeat. The multifaceted checkerboard cut for this big amethyst cushion gem is decorated with angled facets that are mathematically calculated, the objective is to optimize the sparkle and glitter of the gem. Light that is captured from the top of the large amethyst, enters the stone and is internally reflected on the precisely angled facets. The reflected light then rushes out from the gem and is further bent and refracted by the facets on the top - the result is an eye catching display of beauty and color. Any gem expert would tell you that medium purple amethyst gems are perfectly suited for such intricate work where, the gem grabs your attention and keeps you in a trance. 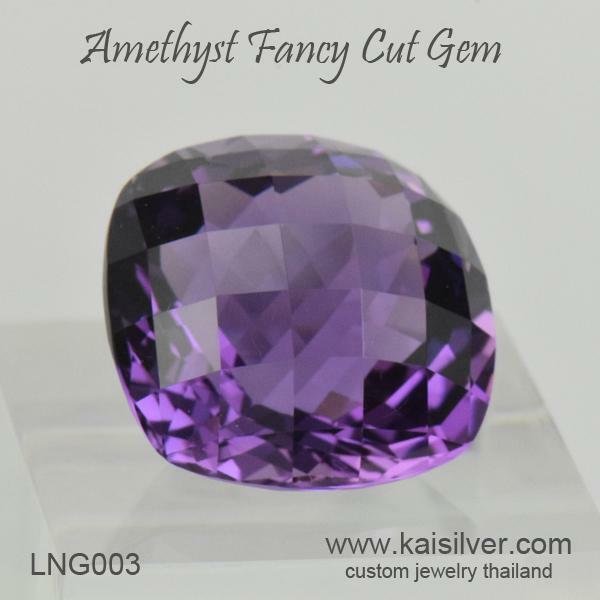 So what can you do with such a tremendous amethyst gem. With the beauty, large size and tremendous cut invested in this large cushion amethyst, you really do not need a complicated design for a pendant or very opulent ring. Keep the mount simple and avoid cluttering and flashy display, basically let the gem take center stage while you bask in the admiration and attention that it attracts. Having said that, the fact remains that a talented designer can tremendously enhance the beauty of the gemstone with his or her creativity, so let us leave it entirely up to you. Contact our support team at sales@kaisilver.com with any questions or queries that you might have. We can at times fulfill special requests for custom cut gems but, it really depends on the spare capacity that we have at that point of time. Given the extremely high rate of weight loss that occurs when doing such complex gem cutting tasks, we recommend the selection of moderately priced gemstones. From our experience, we have found white topaz, white quartz, champagne quartz, smoky quartz, citrine, amethyst and a few lab created gems to be suitable as material to showcase the fascinating art of gem cutting.